Easily chat with customer via. Live Chat while you are on-the-go or away from your desk using our Live Help Android app. The Live Help Android App allows you to chat with and monitor your browsing web site visitors. You are able to see who is currently browsing your web site and accept incoming chat requests from your web site visitors right on your Android device. Live Help also allows you to view chat history and manage operator accounts right from your phone or tablet. The Live Help Android app allows you to receive notifications for incoming chat requests and new chat messages when you don't have the Android app open. We also support Google Cloud Messaging to help increase battery performance and decrease battery drain when logged into Live Chat (Requires Live Help Server Software v4.0 or above). Live Chat away from your office! We offer both Android and iPhone apps so that your operators can chat with customers when they are on the road. Our Android app is sold separately within the Google Play Store. The Android app supports large screen devices such as the Google Nexus 7 device and mobile phones such as Nexus S, Galaxy Nexus and Samsung Galaxy devices. The Live Chat Android app includes a visitors widget that allows you to monitor the site visitors that are browsing your web site without opening the Live Help Android app. Easily monitor your web site and view the details for each browsing visitors. The Live Help Android App is available exclusivily on the Google Play Store. 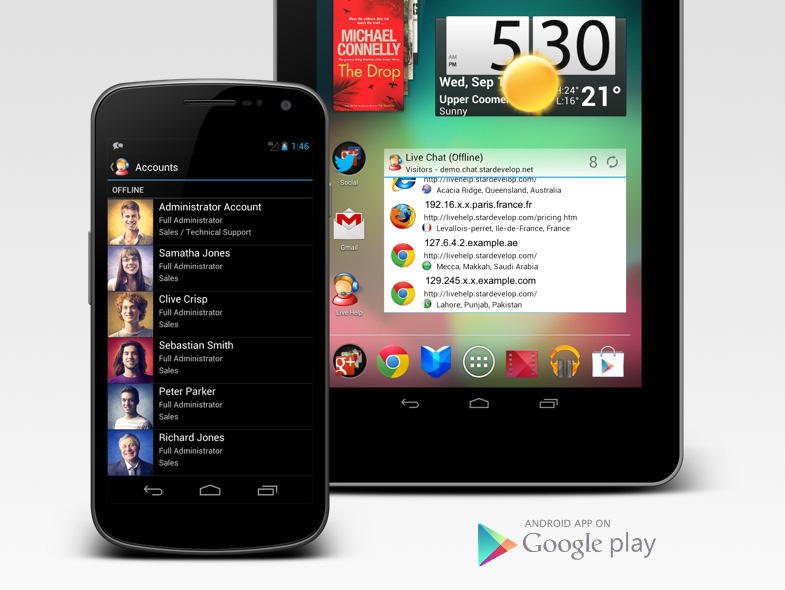 The app supports both phones and tablets such as the Google Nexus 7. The Live Chat Android app is available separately for purchase from US$9.99 (approx. 10,99€, £8.98 and AU$12.99). Updates to the app are delivered for free through Google Play.